For eggplants: slice lengthwise into 1/2-inch slices. Arrange slices onto a large rack (or several cookie sheets). Sprinkle generously with salt, and let sit for 30 minutes. After, flip slices over and sprinkle with more salt; allow to sit for an additional 30 minutes. Rinse all slices thoroughly, and arrange on rack(s) to dry; set aside. For sauce: heat oil over medium heat. Add onion and sauté for 5 to 7 minutes, stirring occasionally, until translucent. Add tomato paste, and cook for a few minutes or until somewhat glossy (to help reduce its acidic flavor). Add garlic and cook for another minute. Pour in wine, and allow to reduce by half. Add tomatoes, water, herbs, salt and pepper; allow to cook for 15 minutes, stirring occasionally. Process sauce in a food processor (in a blender or with an immersion blender) to desired consistency; cover with a lid to keep warm. For filling: combine ricotta, 1/2 cup mozzarella, sun-dried tomatoes, and basil; set aside. For assembly: brush eggplant slices with oil; heat grill or grill pan to medium-high heat. Grill slices until cooked through, about 3 minutes per side – allow to cool slightly. Place 2 tbsp filling at one end of each slice; Roll the eggplant tightly, starting at the end with the cheese mixture working towards you (like a jelly roll). Preheat oven to 350 degrees. 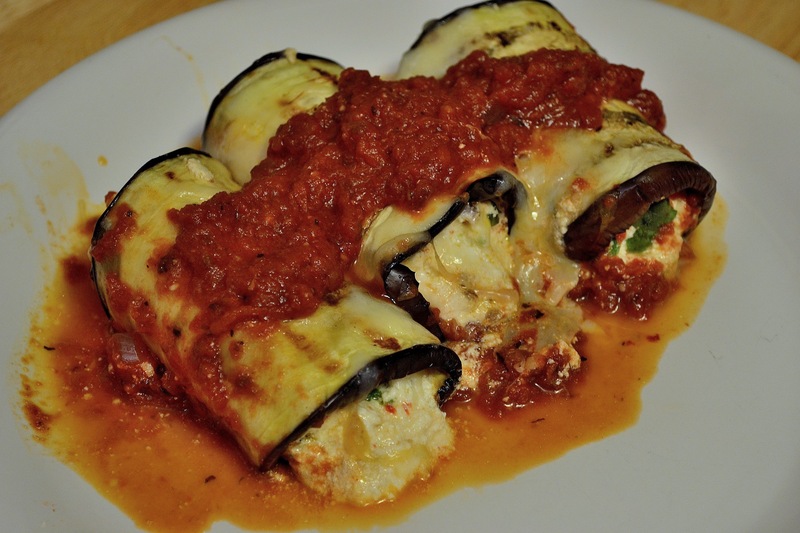 Pour the tomato sauce into a 9×13 baking dish, and place the eggplant rolls seam-side down. Place the pan into the oven, and bake for 15. Remove from the oven and sprinkle with remaining mozzarella cheese, and bake for an additional 5 minutes – serve immediately. Read more about this dish and my musical pairing by clicking HERE. Anne – this looks yummy! I have all the ingredients at home, except my ricotta is fat free – what are your thoughts on that? Think it will be runny or yucky? Good question – it won’t be runny, but it might not melt as smoothly (or be as creamy). Aside from that, I don’t imagine it will be a huge difference. Let me know how it turns out!